In recalling our nation's bicentennial celebration in 1976, I remember the national pride that was 200 years in the making. I stood shoulder to shoulder with classmates and friends from Matamoros, Mexico, who joined me in marking the occasion. 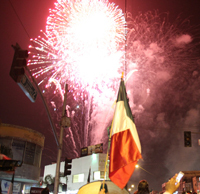 Now, on September 16, Mexico takes its turn in celebrating its own bicentennial. Two hundred years young and a burgeoning democracy, Mexico has much to celebrate and many significant challenges that must be faced head on. Our two nations today are more intertwined than at any other point in our shared histories. Grow up along the border and you understand the cultural, historical, and economic connections better than most. Live anywhere in the United States or Mexico today, and you hold an appreciation for why now, more than ever, the two countries must work together. So, where will the United States stand as Mexico looks to its next 200 years? Unfortunately, the rhetoric of late, charged by election-year politics and singed by the fires of the immigration debate, suggests something less than solidarity. We may be a bit off from our heyday of $1 billion a day in two-way trade, but in spite of the softening of our economies, the United States and Mexico are closing in on $200 billion in trade this year alone. Mexico’s Ministry of Economy reports that the country has seen more than $12.2 billion in foreign direct investment during the first half of 2010, of which the United States accounts for nearly 30 percent. There’s simply no argument or doubt that our two nations’ economies are increasingly interconnected. Mexico faces real and significant institutional, security, and economic challenges and, if left on its own, it most certainly cannot overcome them all. I am not naïve: their challenges are fueled by nascent institutions and endemic corruption, as much as U.S. demand for illicit drugs and the flow of arms south. How will the United States view and treat its southern neighbor as its bicentennial celebrations end and the next chapter in Mexico history begins? If one looks closely, you will find evidence of some striking security successes from the Calderón administration. Last month’s capture of one of the world’s most infamous drug kingpins, Edgar “La Barbie” Valdez Villarreal, is clearly a political and security coup for President Felipe Calderón and one more example of the president’s unwavering courage and commitment to the fight. Mexico’s Secretary of public security, Genaro Garcia Luna wrote in Americas Quarterly that he remains steadfast in his commitment to building the type of institutions necessary for the long-term benefit of the country. The secretary’s work to modernize the police force is perhaps one of his most significant and ongoing efforts, a key component of his broader strategy to build a reliable, modernized justice system. While increasing the size of the federal police force to over 30,000 officers, Garcia Luna incorporated stricter recruitment and retention guidelines as well. His recent dismissal of 3,000 police officers for failing to meet the country’s new standards for professionalism and integrity shows just how committed Secretary Luna is to meaningful security and justice system reform. Recently elected President of Mexico’s Senate Manlio Fabio Beltrones also made clear that more aggressive institutional reforms are critical. Throughout his career, Senator Beltrones has played a fundamental role in pressing for reforms aimed at unemployment, as well as political and judiciary reforms aimed at improving transparency. In Mexico, there’s a great appreciation for Senator Beltrones’ behind-the-scenes ability to find consensus, bridge political divides, and advance reform. The Senate leader has a keen sense of where Mexico needs to go, and he is right to press for change that will enhance the long-term security and economic competitiveness of his country and its people. And, in spite of an almost daily dose of violence reported by U.S. and Mexican media, Mexico’s resiliency in light of the global economic downturn is often overlooked, but no less remarkable. Mexico’s economy is expanding, and the country’s gross domestic product is forecast to grow at an annual rate of 7.5 percent, according to the median forecast of 21 economists surveyed by Bloomberg. In fact, some of the strongest signs of partnership between our two nations are exemplified in individuals and businesses building stronger cross-border relations, increasing investment and paving the way for greater sustained economic prosperity and progress. Take Roberto González Barrera, the chairman of Gruma, who turned 80 this month. You may know Gruma, the largest global producer of tortillas and corn products with more than 20,000 employees, from products on your grocery store aisle. But his leadership and involvement in the communities Gruma serves are the stuff of legend. Don Roberto, as Barrera is called in Mexico, grew up poor in a poor country and in the wake of the Great Depression. But, today he has given millions of dollars and countless amounts of his personal time to border communities in Mexico. He has supported massive hurricane recovery efforts in Nuevo Leon and attacked world hunger head on through support of organizations like Feeding America in the U.S. He’s a proud and iconic Mexican leader, but one who daily demonstrates a commitment to communities in the U.S., as well. More U.S. companies are beginning to appreciate the incredible consumer market in Mexico and understand the role private investment can play in strengthening infrastructure, education, and communities. Motorola is one such example, celebrating 50 years in Mexico this month. Their semiconductor plants and engineering design centers in Monterrey and Nogales spur further foreign direct investment. But, more than jobs or products, Motorola also invests in Mexico’s future with substantial support and high-tech equipment for universities, research institutions, and students. The company’s recent announcement of a $500 million investment in Mexico over the next five years is proof positive Motorola sees great potential in this emerging market. These are just two of the stories of partnership and belief in our countries’ economic, social, and familial connections. It’s not the sort of front-page headlines you’ll read most days, but it underscores the type of private sector partnerships and economic development that will richly reward both nations and their people. This month, as Mexico marks 200 years, let’s be certain both countries fully appreciates not only the challenges but also the incredible opportunities that lie ahead for us, and for our people, together. Antonio O. Garza is a former U.S. Ambassador to Mexico and an Americas Society Board Member. He is counsel in the Mexico City office of White & Case and a partner with ViaNovo, a U.S.-based public affairs consultancy. Ambassador Garza is online at www.tonygarza.com.